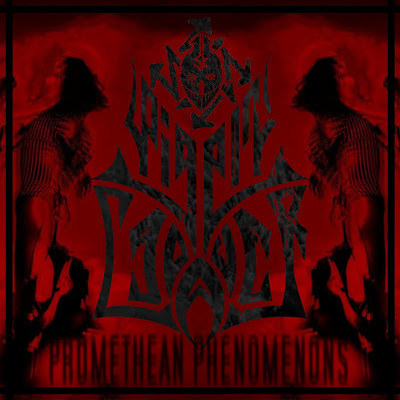 Promethean Phenomenons EP by Pigeon Cadaver, is a giant leap towards a big sound. The Germans LP Musiken So Wertvoll Wie Golddublonen (2011) had a lot less hugeness in it and the sort of randomness that you often find from free-download artists. Promethean Phenomenons seems to have shrugged off the randomness but still remains dark and melodic speedcore. It sounds very intact and thought; the flow during the release is remarkably good. The quick drum-pounding and much varied beats are still the backbone. Sometimes the beatwork even gets to lolicore (aka ridiculously fast) tempos but the music doesn’t stray to humour genre. There is a lurking funniness in it, but it is more subconcious. The big sound does make Pigeon Cadaver lose a lot of the tribal(?) feel that was apparent in his earlier releases. But in general it is an improvement, the grand ambients support the compositions unlike before and Pigeon Cadaver is now a lot more than just a percussion driven artist. Still for example Homicide Unleashed finds a way to turn up a catchy tribal beat in the end. And before that, what a VAST surge it is! One thing hasn’t changed, the catchy parts are often too short. Its good effect is that the less catchy parts often end before you get annoyed by them too. The main themes around the tracks are well thought and don’t wear off quickly, although killer melodies remain absent. From somewhere in the depths Promethean Phenomenons finds that odd mystic-tinge, feel from somewhere beyond. It is more than the sum of its parts. More thrilling than its musical output is. Mystique titles like Resurrection Ω and Praestigiae and classy use of sound clips help triggering it. The mentioned Resurrection Ω is the standout track. It uses a majestic touch of female choir ambience with very rapid drumming. The old Pigeon Cadaver couldn’t have done this.